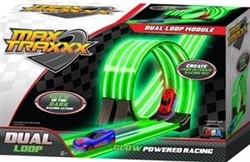 Max Traxxx Glow in the Dark Racing System introduces the side by side Loop. This exciting component allows you to expand your track with a stunning dual loop. Includes loop apparatus and 2 pieces of loop track.